Mr. Adler was raised and educated in Montreal. In 1970 he graduated from McGill University with a Bachelor of Arts degree, majoring in sociology and political science. While at McGill, Mr. Adler worked for the public relations firm of Edward Bantey and Associates on a variety of projects. While attending Osgoode Hall Law School, Mr. Adler co-authored a study and report entitled “The Police Function in Our Changing Society”, which was jointly sponsored by the Solicitor General of Canada and the Foundation for Human Development. In 1972 and 1973, Mr. Adler was named Special Project Directory for the Ministry of the Attorney General of Ontario and worked with Chief Judge Ted Andrews of the (then) Provincial Court (Family Division) in the complete re-organization and overhaul of that court. Mr. Adler graduated law school in 1973 and articled for the firm of Robertson, Lane, Frankish, Perrett and Estey. He was called to the Ontario Bar in 1975, and practiced briefly with Goodman and Carr before opening his own law firm, now known as Adler Bytensky Prutschi Shikhman. While Mr. Adler’s practice is almost exclusively criminal, he has also appeared before various boards and tribunals and at inquests. He has been retained or consulted in all types of cases. He has acted as counsel in extradition matters, trials and administrative and quasi-criminal hearings throughout Ontario, as well as in Quebec, Manitoba, New Brunswick, the Northwest Territories, Alberta and British Columbia, right up to the Supreme Court of Canada. Mr. Adler has represented individuals arrested or wanted in Europe or the U.S. His advice has been sought out in numerous other instances. Mr. Adler’s experience in DNA cases and other forensic issues has caused him to be consulted by other counsel for these and other legal issues. Several of his cases have been reported as legal precedents including R.v. Rohde, R. v. Fawthrop, and Fingland v. Ontario (Transportation). Since becoming a lawyer, Mr. Adler has authored numerous articles that have been published in a variety of journals. He has appeared frequently on radio and television programs as a commentator with regards to various issues dealing with the criminal justice system. As well, he has either spoken to or chaired a number of committees, groups and seminars dealing with different aspects of criminal law. Mr. Adler is an adjunct professor at Osgoode Hall Law School of York University where he taught Trial Advocacy for over 15 years. He is also a participant in the Intensive Criminal Law Program of that school. Mr. Adler coaches the Osgoode Hall Law School team at the annual International Criminal Court Law Moots. In 2009 Mr. Adler commenced teaching International Criminal Law at Osgoode Hall. 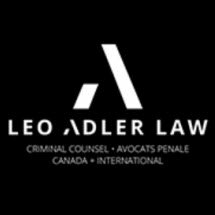 Mr. Adler has also lectured or spoken at various other law schools, including Haifa University, McGill University, University of Ottawa, University of British Columbia, University of Victoria, Syracuse University and others. He is a member of the Criminal Lawyers Association, the National Association of Criminal Defence Lawyers, the International Association of Defence Attorneys and the Canadian Forensic Society. In 2016 Mr. Adler was given Osgoode Hall’s Distinguished Service Award. From 1999 to 2009, Mr. Adler was the Director of National Affairs for Friends of Simon Wiesenthal Center. In that capacity, Mr. Adler was responsible for the NGO’s social action programs and national public relations campaigns. He regularly met with Government Ministers, diplomats, politicians and other officials and has spoken at and attended conferences and seminars around the world, and has provided public commentary in the media on matters relating to war crimes, the International Criminal Court, human rights, the Internet, national security and terrorism and other issues. From 2005 to 2015, Mr. Adler was one of 15 people appointed by the Canadian Government to the Cross-Cultural Roundtable on National Security to review the Anti-Terrorism Act and assess its impact upon society. As a result, he has criss-crossed Canada speaking to groups and consulting with Canadians about how best to cope with the threats and challenges posed to Canada’s security. In January 2006, Mr. Adler was invited by the Government of the Russian Federation to be a part of that years’ G8 NGO organizational committee. As a consequence, he was instrumental in getting the NGO’s to adopt a resolution condemning suicide-bombing and declaring it to be a crime against humanity. He was also in attendance at the G8 conference in Germany in 2007, and his reports were published in the media.